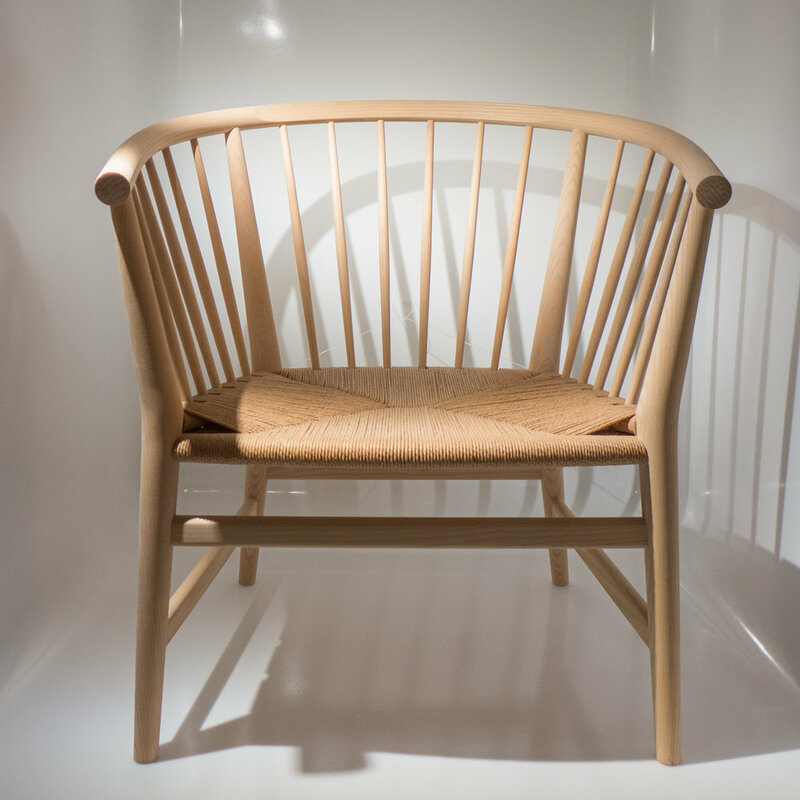 Hans Wegner, through his long career, continually returned to ideas or details of construction … not because he lacked new ideas but what you can see clearly is that as he developed a design he made a sequence of changes or refinements that almost form a route or map of rational consequences through the design process so make one part slightly thicker, and therefore stronger, and it might make it possible, for instance, to make another part thinner or even to remove a piece completely that would otherwise have been needed to strengthen the frame … such as a cross rail. 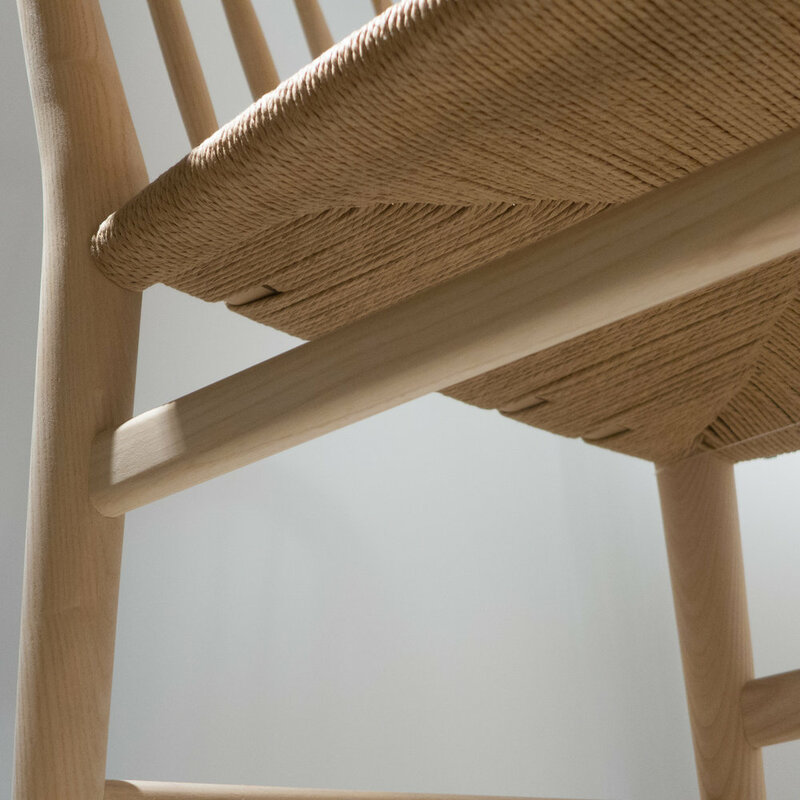 Returning to an idea, Wegner could then take the design through another route or sequence to create a very different chair. 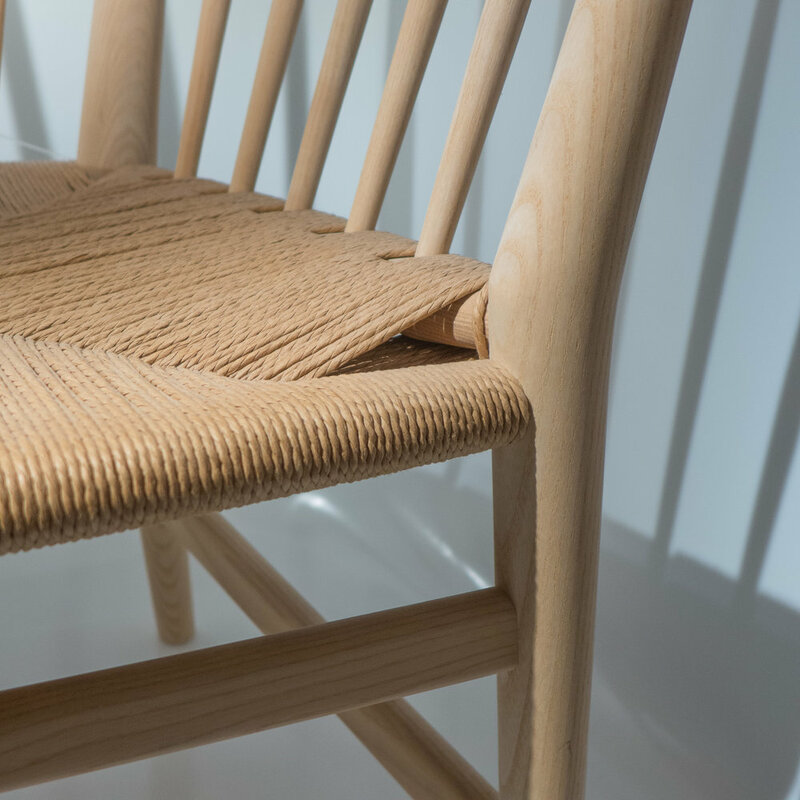 PP Møbler, who make the 112 chair, describe it in their catalogue as a hybrid because here Wegner is combining the line and the single curve of the back of what is normally described as a Chinese style chair with the vertical rails of a Windsor chair … the common form for a Chinese chair is to have a broad curved splat at the centre of the back between the seat and the rail of the back. Here the front and the back legs are taken up to support the back rail and the space at the sides and the back are filled with vertical spindles. These are not straight dowels but turned so they are slightly thicker at the centre with a slight taper to the ends. The seat is relatively wide and slightly lower than on a side chair or dining chair so the 112 also has a slightly different sitting position closer to that of an easy chair. There are stretchers to the sides and to the front and back and these are taller than they are wide - to give a tall but relatively narrow mortice into the legs - and are rounded across the top and the bottom. The side stretchers are deeper than those to the front and back, giving additional strength to the frame, with the front stretcher set up higher from the floor and closer to the seat - so the person sitting in the chair can tuck their feet back under without pressing against a stretcher. The shape and the arrangement of these stretchers is different to the traditional Windsor chair where, generally, there are turned and tapered stretchers, similar in profile to but thicker than the spindles, and often the front and back stretchers are omitted and then there is a cross stretcher between the side stretchers to form an H shape of stretchers under the seat. The back rail of the seat of the PP112 is rounded and the front and side rails of the seat gently curved with the back narrower than the front. 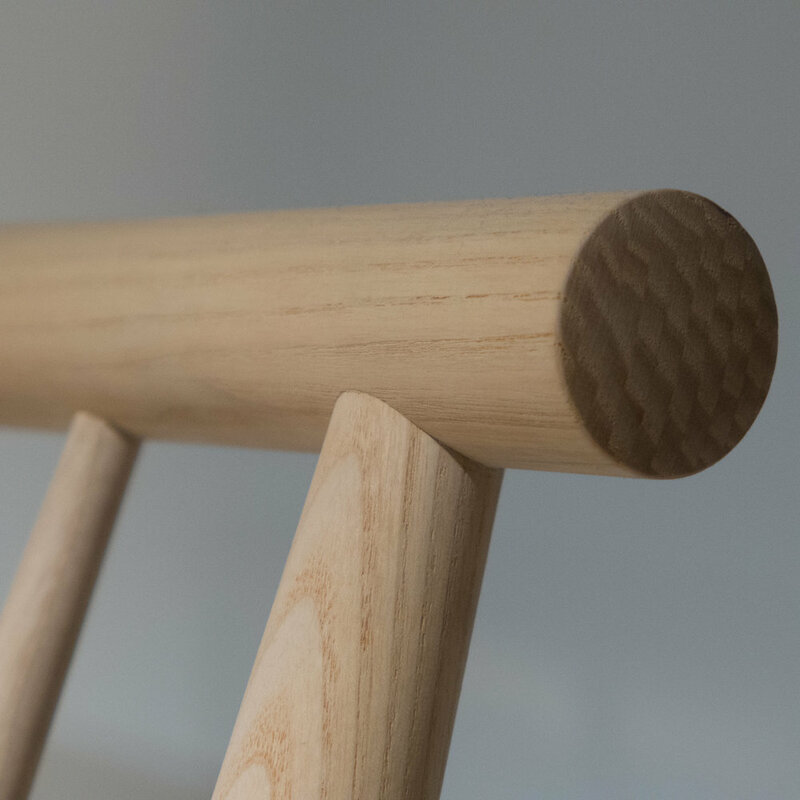 All four legs are thicker towards the centre and have a distinct elbow or angle at the thickest point to take the mortices for the frame of the seat. The legs taper to the foot and to the top where they are housed in the underside of the back rail. The front rail of the seat is set below the side rails, in part to stagger the position of the mortice-and-tenon joints in the leg and partly to create the distinct scooped front line. As the seat is paper cord, this staggering of the rails creates a very distinct arrangement at the front corners and also the unusual combination of cord seat and Windsor rail means that there is a complicated arrangement with some cords being taken down in front of the spindle but most going on and around the rail before returning underneath the seat. This gives the distinct stripe effect on the outer faces of the side and back rails with bundles of cord alternating with exposed wood. This complicated pattern in the weave of the seat must make the work itself much more difficult particularly in making sure that the tension in the cord is constant … if the cords are not tight they will shift around the frame and sag but if the tension is irregular then the cords will tend to bunch up to form ridges across the seat. The back rail of the seat is set lower than the front of the seat so that there is a more pronounced backward lean … again appropriate for what is an armchair or easy chair rather than a side chair or dining chair. 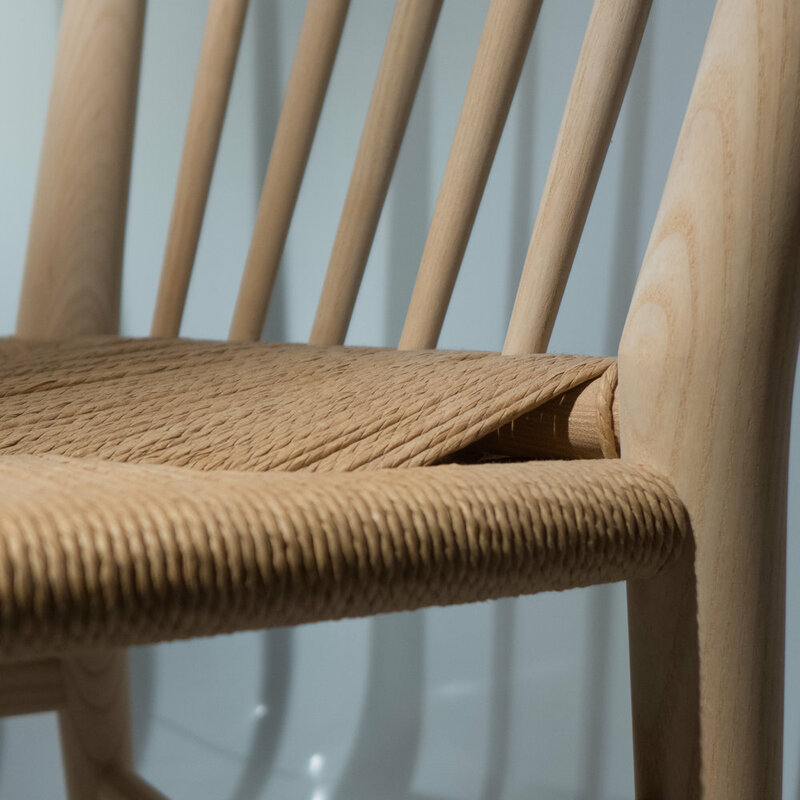 The centre of the back rail is flattened off - so that it does not dig into the spine or shoulder blades - and the ends of the top back rail and the bottom ends of the legs are cut almost flat - rather than being rounded - adding to the character of the chair. It gives the chair a simpler and cleaner look making it more modern and more robust. 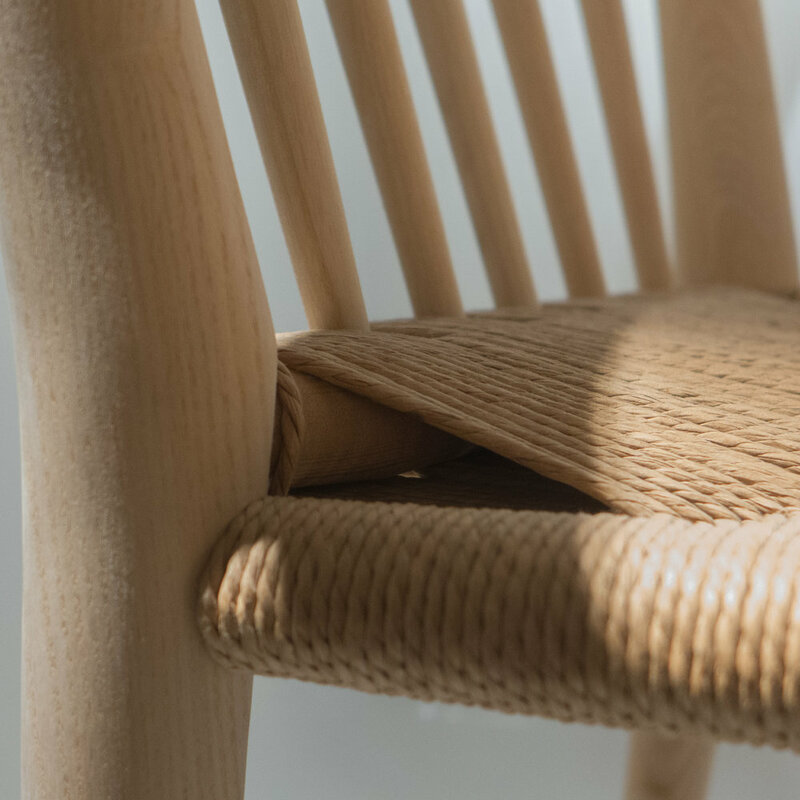 This might seem like an insignificant detail but look at how Wegner rounded the ends of the arms and the foot of the legs on the Wishbone Chair or the Round Chair to create a different and rather more sophisticated character or feel to the finished chair. 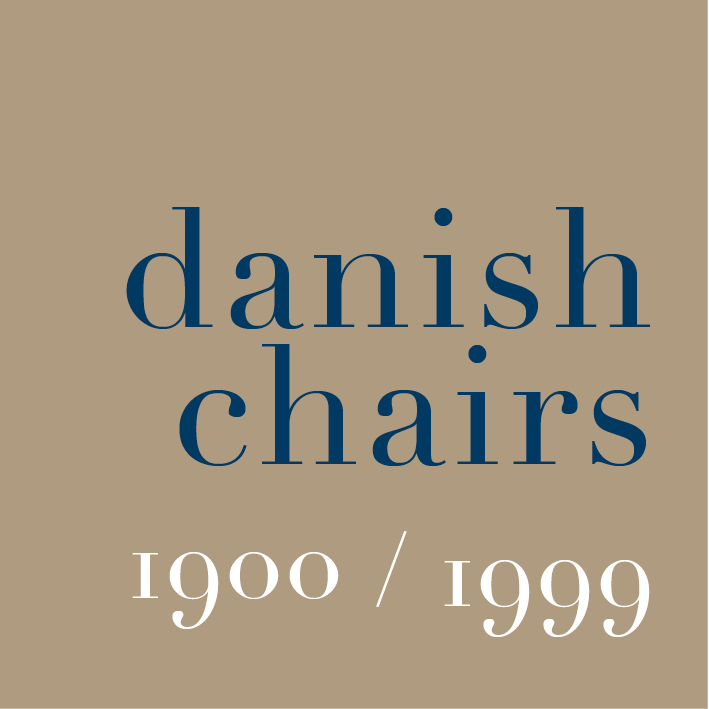 That is not to imply that the PP112 is unsophisticated … it is a very careful design that creates a strong honest country look … and after all, that is exactly what the original Windsor chairs were … strong, honest chairs that were the staple furniture in a good farmhouse or cottage kitchen.